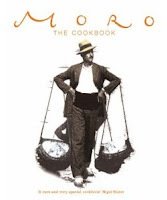 The Moro Cookbook is the first of three cookery books by the chef-owners of the well-known and award-winning Moro restaurant in London, Samantha and Samuel Clark. The book focuses on the husband and wife team’s passion for Spanish, North African and Eastern Mediterranean food. Simple dishes with robust flavours and a Spanish influence are combined with those which are more exotic, fragrant, delicately spiced and Arabic in nature. The combination of Spanish and North African cuisine is not a surprising one given Spain’s history. The invasion of Spain by the Moors influenced much of the Iberian Peninsula – the religion, architecture and undoubtedly the food. That the recipes extend from such a wide-reaching geography makes for an exciting collection to match many a mood, budget and appetite; classic tapas and mezze dishes, hearty, peasant-style meals, rich meat and offal platters, delicate fish suppers and indulgent puddings. 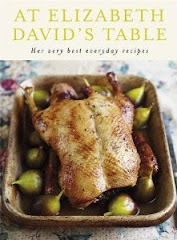 Of course, there are recipes for favourites such as tortilla, chorizo al jerez (chorizo with sherry), baba ghanoush, tabbouleh and pollo al ajillo (chicken cooked with bay, garlic and white wine) but there are also some more surprising and interesting recipes like quail baked in flatbread with pistachio sauce, cod baked with tahini or bitter chocolate, coffee and cardamom truffle cake. Some of the ingredients are mystifying and, for anyone outside of London, could be difficult to source. The lack of photographs amongst the recipes and almost 70’s look to those which are there mean that it’s quite difficult to imagine how some of the more unusual or unfamiliar dishes should look. Don’t be put off, once past these first hurdles, the recipes are quite simple to follow and the food, for want of a better word, delicious. Had we known just how soft textured and flavourful the torta de naranja (orange and almond tort) was or could have seen how beautiful it looked, we all would have baked it a lot sooner. It’s a regular from now on! There’s a theme to many of the recipes; stages of long, slow cooking which are well worth pursuing as the result is an intensely flavoured and satisfying meal, even from the simplest of ingredients. The patatas a lo pobre (poor man’s potatoes) is just one such example, sweet, soft and extremely tasty and yet made from just a few ingredients – onions, garlic, bay, green pepper, potatoes, olive oil and seasoning. One of the more surprising dishes was the sopa de setas (mushroom and almond soup with fino sherry). What started out as, albeit tasty, mushroom flavoured water was brought alive and thickened by the addition of crushed almonds. The Moro Cookbook helps us reach a true understanding of Moorish food, an often over-looked and under-appreciated cuisine. A word of warning! The bitter chocolate, coffee and cardamom truffle cake recipe calls for 30g crushed cardamom pods. This is a tremendous amount of cardamom and the end result is intense. The combination works very well but if you’re not a huge fan of cardamom, we would recommend cutting back on the quantity.